Creating a successful marketing strategy all starts with defining your objectives. But what’s the best way to identify your marketing objectives? Should you choose goals based on the platforms (Google, Facebook, etc. ), you plan to utilize for reaching new customers? Or should you choose to experiment with some marketing tactics that seem reasonable, commit to them, and go for it? If you tried either of those approaches, it’s likely that you didn’t get the results you were hoping to achieve. Trust me; we’ve all been there. Why don’t these approaches work? Because neither of these approaches is strategic, they are an assembly of tactics being passed off as a marketing strategy. You probably know by now that marketing is the mechanism that drives customers to your business. But a good marketing strategy isn’t about playing a game of copycat. Good marketing is about connecting with potential customers and making them familiar with your solution, then convincing them to go forward with your solution over all others. So if you want your business to grow, it’s important to be precise and well thought out with your marketing objectives. 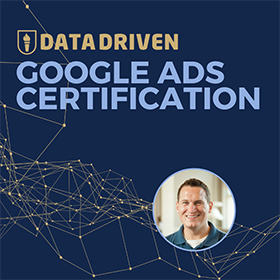 In this post, I will teach you how to use my four-stage marketing model, ACES, to establish your data driven marketing objectives. We’ll also look at how to use your objectives to guide your marketing strategy. And I’ll show you how you can track and measure your progress towards achieving your goals. Identifying goals for any organization is a leadership level responsibility. So as you define your objectives for your marketing, try to think about them from the perspective of your CEO. So let’s put on our CEO hats and listen to a few pitches. Two marketing firms are vying for your business, which one of these two pitches would resonate with you? Obviously, Pitch A lacks the substance and vision of Pitch B. What really makes Pitch B more enticing is that it accounts for how the objective (up to 100,00 monthly website visitors) will provide tangible value to the business. You can do the same when you define marketing objectives that are data driven. Sure, it will take more work. But that work will break down any and all barriers to your success. If you follow the process I outline in this post, you will have a leg up on connecting your marketing objectives to the valuable outcomes your efforts will produce. But before we can connect all the dots, let’s take some time to define common terminology that we’ll use throughout this post. 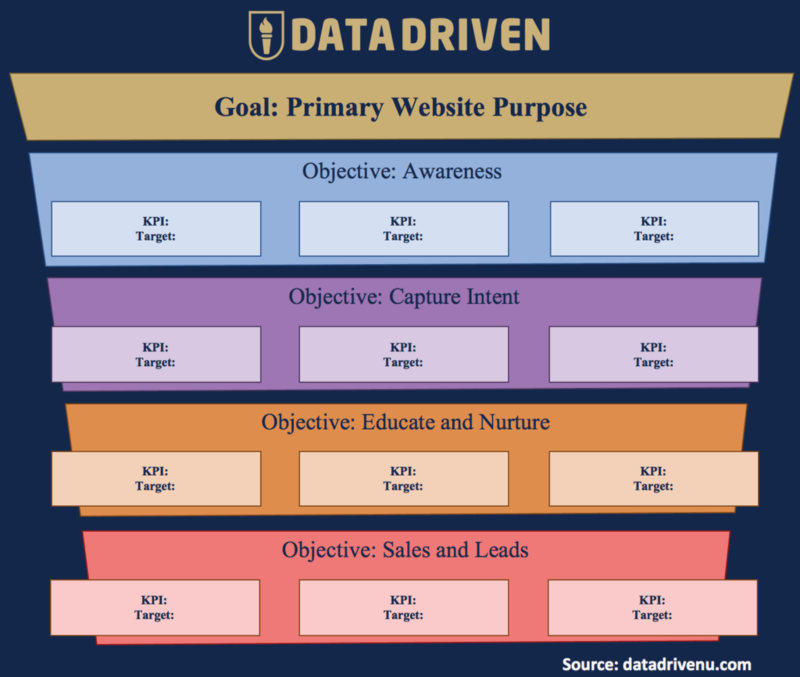 What is a marketing objective? A marketing objective, in the simplest terms, is the result you expect to achieve for any activity that helps establish a market for your products and services. 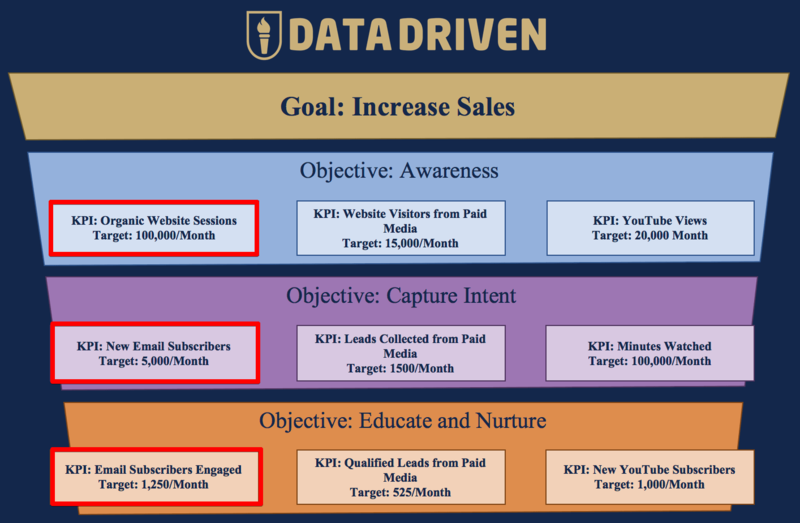 Marketing objectives are typically tracked using KPIs (Key Performance Indicators). You’ve probably heard all these KPIs at some point and may have even tracked your progress against them in a dashboard, like our marketing report template. Before we start identifying your marketing goals, let’s talk about how NOT to choose your targets. Businesses tend to make two big mistakes when they identify their marketing objectives. Almost every purchase is made through a four-step customer decision making process. Traditionally, the customer’s path to discovery follows the AIDA model (awareness, interest, desire, action) and is represented visually as a funnel with four steps. The problem is that most marketing teams are overworked and only execute programs that reach the top or bottom of their customer journey funnel. In doing so, they fail to consider two of the most critical stages of the customer journey. You can avoid making this mistake by using the model I have developed (called ACES) to see how your marketing tactics impact your results at every stage of the funnel. More on ACES in a moment. Another common mistake businesses make when choosing objectives is failing to evaluate how the resources they have available will impact the likelihood of achieving their goals. Setting a 200% to 400% growth target can be a big exciting goal. But if you’re not increasing your budget, or deploying new expertise to achieve these results, your goal is more likely a dream than a valid target. To achieve your marketing goals, you need to assess the impact of your budget, team, tactics, and tools on your expected results. Ok, so far we’ve discussed what not to do. Now let’s talk about how to set marketing targets that you can actually achieve. A marketing funnel is a way to picture the journey your audience takes on their way to (potentially) becoming your customer. 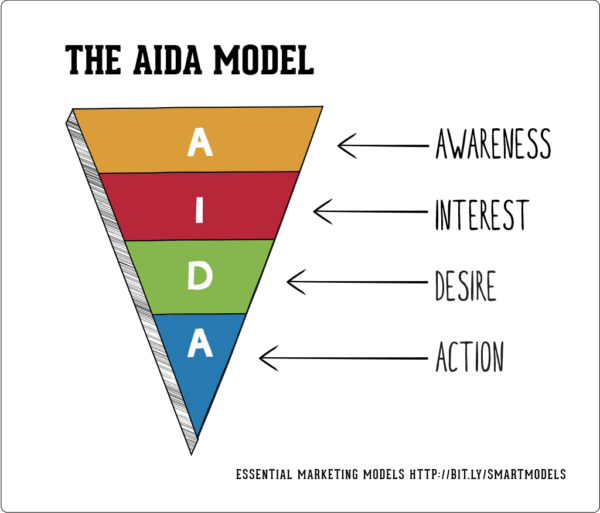 In the AIDA model, your marketing message attempts to gain your audience’s attention. Then your prospective customer shows interest in your message or offer. That interest elevates to desire. And finally, if you’re successful, your audience takes action on your offer. The AIDA model is an excellent representation of the customer journey, but AIDA doesn’t always put your marketing into context. It’s also a 20th-century model that makes you fill in the blanks with your marketing targets, actions, tactics, and objectives. Without context or targets, AIDA is just another empty vessel. It’s time to take things to the 21st century with the ACES Framework. 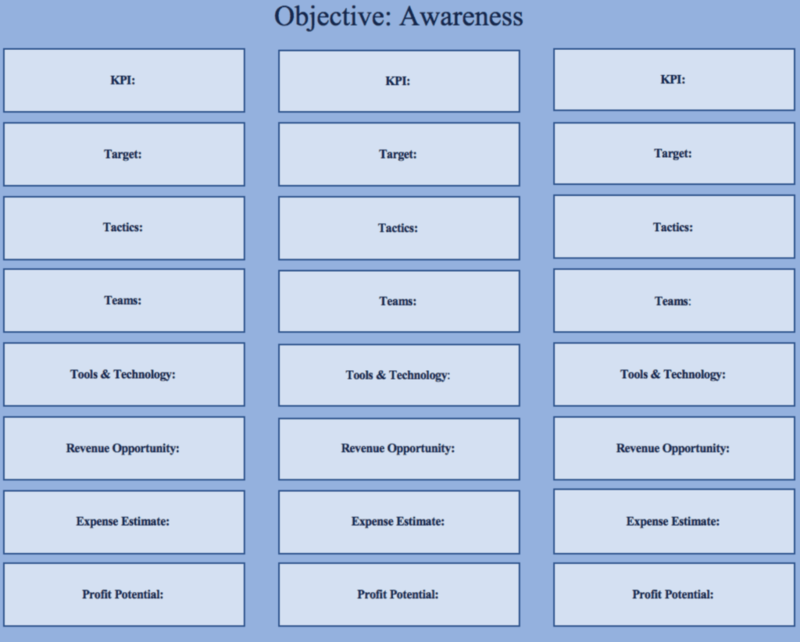 I developed the ACES framework to help marketers match their objectives to their KPIs and their KPIs to their marketing strategy. (A)wareness, (C)apturing Intent, (E)ducating and Nurturing customers, and making (S)ales – ACES. At the top of the marketing funnel, the awareness stage, marketers attempt to introduce new customers to their brand. So any marketing that’s focused on reaching new customers is an awareness related activity. To set your marketing objectives for awareness, you want to match each of your marketing activities to a KPI for your business. For example, if you are doing content marketing to attract new customers, you might focus on organic traffic to your website as one of your targets. If you’re using social media to create awareness, you might choose post reach, social media traffic, or audience growth as a KPI for your awareness objectives. And if you use display ads to raise awareness, you might choose ad impressions as your top-of-the-funnel KPI. Capturing intent is the next step down the ACES marketing funnel. At the capture level, marketers attempt to encourage their newly aware audience to continue to engage with their messages. We want to capture our audiences’ intent to learn more about our brand or products. And we want to establish a direct line of communication with our audience. While much of the buzz these days is around advanced capture tactics, like remarketing to traffic from paid ads with a link to a landing page with a targeted message, there is also tremendous value to be gained from sticking to the fundamentals of capture: Optimizing for email collection. After finding a way to continue to communicate with potential customers, marketers want to keep the dialogue going. We want to nurture the interest that attracted our audience to our brand. And, we want to educate prospective customers about how our products or services can solve their problems. The final stage of the marketing funnel is sales and leads. This stage is where marketers try to convert their audience into paying customers. Once you have some objectives in mind, it’s time to add the numbers that will give your plan substance. Unless you’re starting from scratch, you can use your existing marketing data to set baselines for your targets. 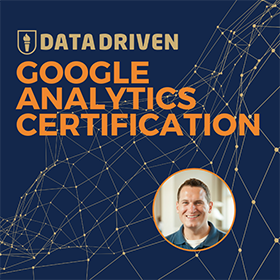 This process often begins with pulling traffic or campaign data from Google Analytics. Want a simple solution that shows how your website has been performing? Use our Year-In-Review Data Studio Dashboard Template. After you have an idea of how your marketing was working in the past, you can start setting growth targets. Every target you set should be associated with a KPI that you can track moving forward. We’ll talk more about tracking and measurement in a bit. You can use the second part of the ACES Template to help you identify the resources you need to achieve your objectives. It’s important to make sure the targets you have chosen are in-line with the resources and skills of your marketing team. You want to consider who will deploy the tactics that will allow you to hit your targets. For example, if you’re doing content marketing, does your team include a writer, videographer, or social media specialist? Or do you have a budget to acquire those skills? You also want to identify the tools your team will need to accomplish their mission. Finally, you want to consider the revenue opportunity, the cost, and the profit potential of your objectives. You should be able to determine the cost of your objectives by estimating the hours of work it will take to achieve these goals. Then, combine the human cost of your efforts with the expense of your tools, (and your potential advertising fees) to estimate your total costs. Your profit potential will be your revenue potential less the costs to produce your product or service. Figuring out your revenue potential can be tricky for your top and middle of the funnel objectives. You can use your existing data (or your best estimates for your business scenario) to help you calculate how these objectives will impact your revenue and profit. Let’s look at how you can use the ACES model to estimate the revenue potential of a marketing objective. Let’s say our website traffic target is 100,000 monthly sessions. And we know that at the capture stage of our funnel our conversion rate is about 5%. Essentially, we expect to collect 5,000 email leads from every 100,000 website sessions. If the email open-rate is approximately 25%, we know that from 5,000 new email subscribers, we wind up with 1,250 people who engaged with our email content. Say in this scenario we are selling a $200 product. We can expect to generate $100,000 a month from our organic website traffic… Or $1 from every session on our website. Is your objective the right target? Your numbers may look better, worse, or far more complicated than this fictional example. The point of this exercise is to use existing data to see how your goals impact your bottom line. And then you can see if the growth opportunity you’re targeting is expected to be profitable or at least cost-effective. 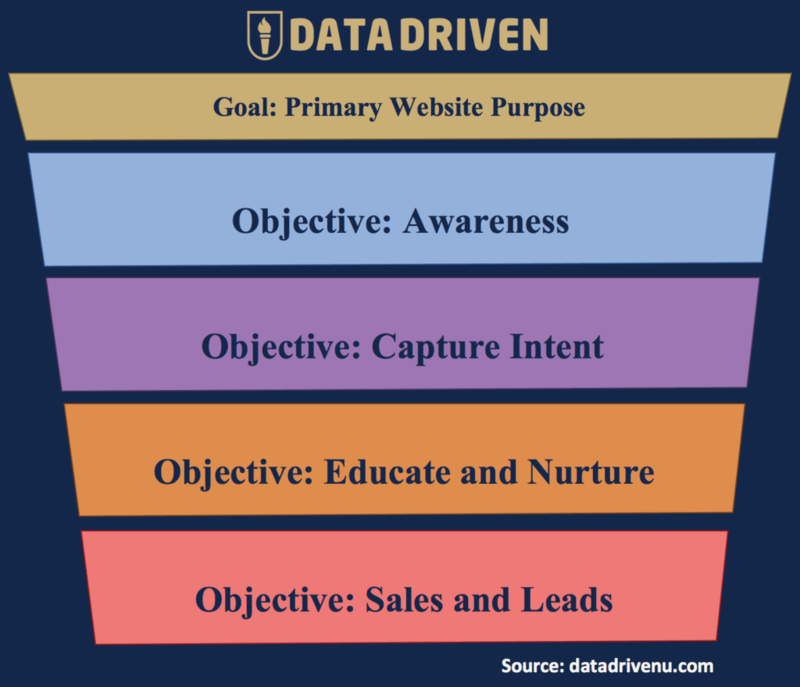 Looking at your how your objectives affect all four stages of your marketing funnel helps you get the most out of your budget. For example, you may discover you can make a bigger impact on revenue by prioritizing middle funnel objectives over your top or bottom of the funnel goals. The most critical parts of establishing these data driven marketing objectives are data collection and measurement. You can’t improve what you can’t measure. So collecting and evaluating the data associated with your KPIs is crucial to your success. Google Analytics is the most widely used online data collection and analysis tool. GA can track so many different things for your business: Traffic, conversions, campaigns, paid advertising, sales, and even offline media. Although Google Analytics has vast capabilities, you may still find you need information from your other databases to track all your KPIs. 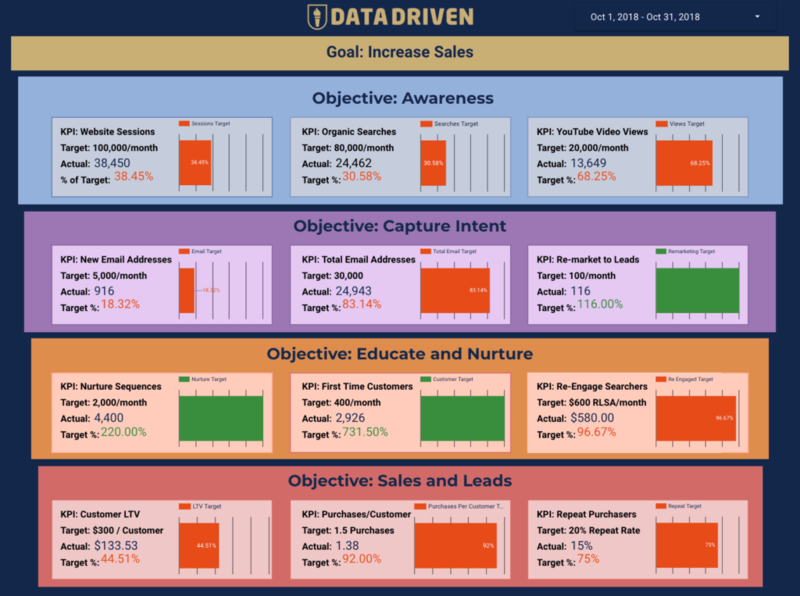 Over at Data Driven, we’ve built a consolidated, automated dashboard to track the KPIs associated with each of our marketing objectives. The ACES Data Studio Dashboard is designed to flexible enough to connect to just about any marketing database you use – Google Analytics, email marketing suites, payment process systems, etc. This dashboard also saves my team from constantly pulling data to check on how we are progressing towards our goals. It’s like an up to date scorecard we check anytime we need. Want to get access to the ACES Data Studio Dashboard? You can get access to my ACES Dashboard, template, and KPI tracking system when you set up an account on Data Driven. Click below to grab these resources. 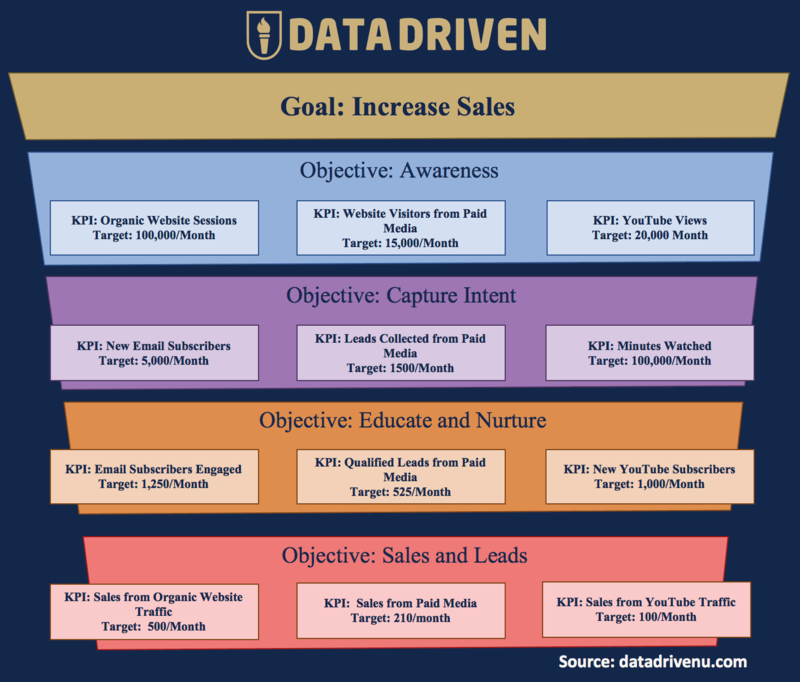 Are your marketing objectives data driven? 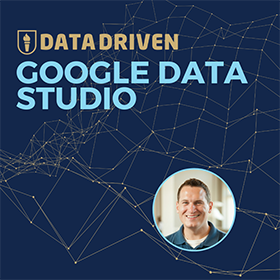 I shared my process for defining data driven goals. Now I want to hear from you? 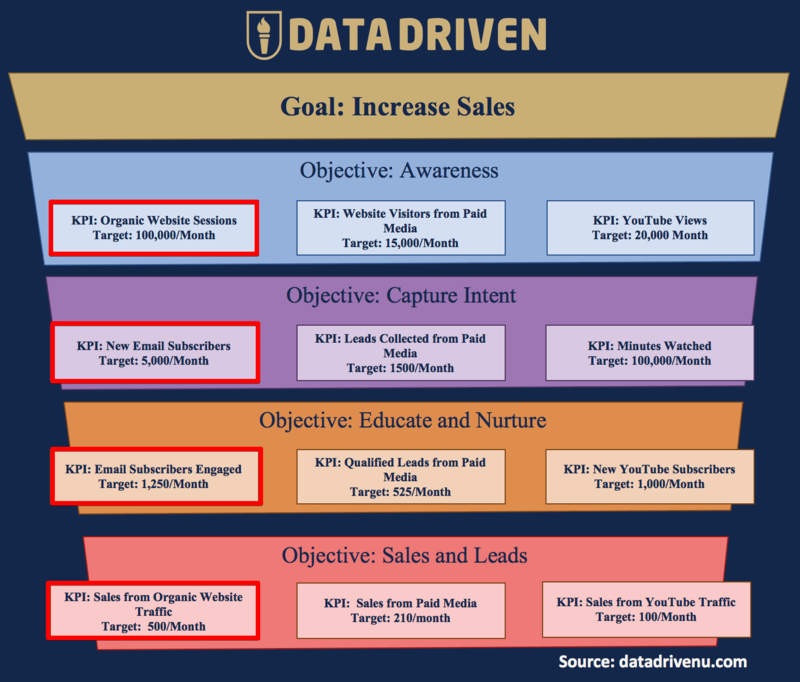 Do you have a method for connecting your growth objectives to your data? Or can you use the ACES framework to help define your goals? Share your thoughts in the comments below.